The Big Wobble: 10 tons of dead fish suddenly surfaced in a 2 hour period in Zhejiang PuTuo China : Boat Captain "sea fishing for more than 30 years never seen such a thing"
10 tons of dead fish suddenly surfaced in a 2 hour period in Zhejiang PuTuo China : Boat Captain "sea fishing for more than 30 years never seen such a thing"
Fisherman said they caught nearly 10 tons of dead fish in a two hour period. Apparently two fishing boats were in operation when suddenly thousands of glistening yellow croaker floated to the surface. Swarms of them surfaced in the next 2 hours with the fishermen caught nearly 10 tons in total. 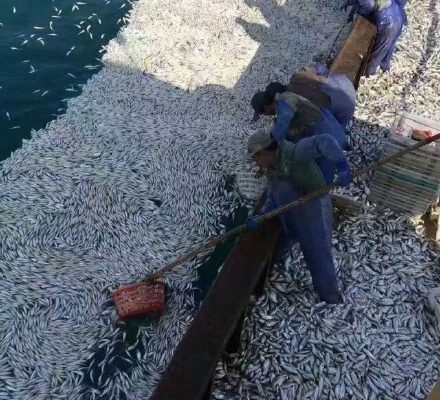 According to the evening news reports in Zhoushan, Captain Zhang of one of the fishing boats claimed the boats where surrounded by a radius of nearly 100 meters of dead fish. The other fishing boat captain of Xia Guoping said, it felt incredible, he said he had been sea fishing for more than 30 years, and had never encountered such a thing. The fish are thought to have died from a toxic substance. Do you think it could have something to do with underwater volcanos? Volcanic activity on land is increasing and there are tonnes of underwater volcanos. Even if it wasn't a full eruption but an incresed venting of volcanic gases, as frequently happens before eruptions. Even just the gases I would imagine could kill fish. we are in the birth pangs, the end of days. Harvesting the fish suggests crew knew the fish are safe for consumption and that in turn suggests they knew exactly how the fish died. Possibly killed electrically which I believe is banned.